The Fall 2012 outerwear catalog with mens and women’s matching jackets is ready for download, with all items in stock for immediate shipment. We have not loaded all the items in our online store yet, so call for the latest items. Optionally add logo embroidery to any of these items. The ultimate executive and incentive gift. The special markets collection is designed especially for adding your embroidered company logo. Mens outerwear sizes small, medium, large, x-large, xxl, and some items 3xl. Women’s outerwear sizes x-small, small, medium, large, x-large, xxl. If you need help choosing the right gift item, call us for expert assistance. 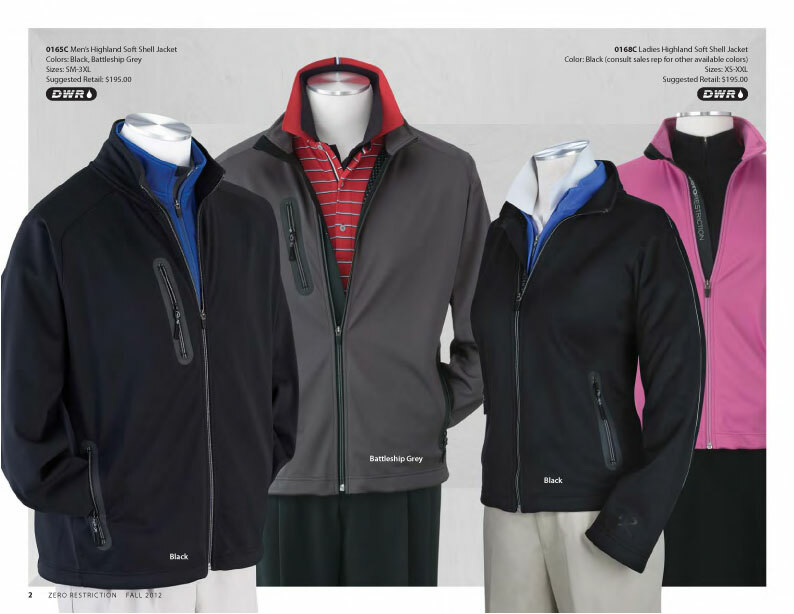 Click here to get the 2012 Zero Restriction outerwear catalog. Click here to shop online for Zero Restriction outerwear now. Our most popular waterproof golf outerwear are the Zero Restriction packable jacket and pants. Golf trips to Scotland and Bandon Dunes are not complete without the best foul weather gear. We offer optional logo embroidery of your company logo or event logo at the factory for greatest quality. At CEOgolfshop, the black pants and jacket are in stock year round. Other colors are available seasonally. 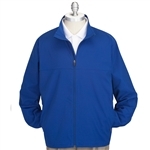 Men’s Waterproof Packable Jacket, style 0192 is made in sizes small, medium, large, x-large, 2XL, and 3XL. Ultimate lightweight packability–packs into small pouch in concealed pocket. Patented Motion-Tuned technology, including expansion back pleats. Snap off sleeves for quick conversion to a half-sleeve jacket. • Patented Motion-Tuned technology provides comfort and full freedom to swing, including Expansion Back pleats. • Easy conversion to half sleeve. 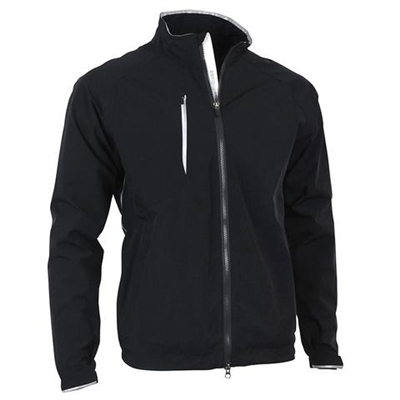 • Two way zipper allows front of jacket to lay flat when putting. • Zippered hand pocket for secure storage of essentials. • Stuffs into inner zippered pocket. 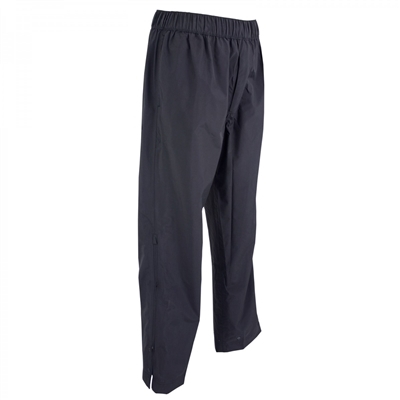 Men’s Waterproof Packable Pants style 0195 is made in sizes medium, large, x-large, and 2XL. 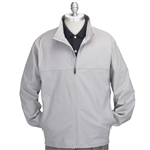 Packable fabric combines breathability and durable wind and waterproofness with minimum weight and easy packability. • Front hand pockets feature zippered pass-through for access to pants. • Adjustable waistband with elastic drawcord and zippered fly. • Rear pocket provides ample storage for glove or scorecard. • Leg zippers with Rain Gutter provide easy on/off over golf shoes, and Ankle Hugger snap system helps keep water out of your shoes. See also ladies packable waterproof golf pants. There is no matching “packable” jacket. The Michele jacket is the only option from this brand, of which there is also a matching pair of Michelle pants. The popular highland jackets are back in matching mens and womens ready for your logo embroidery, optionally completed at the factory for quality assurance. TechGrid inside for moisture dispersion and comfort. • Elastic drawcord in hem for fine-tuned fit. • Cuffs feature soft interior gasket for comfort and easy fit. Contact us for quantity discounts and all customization.